bongo drums «Suad Bejtovic Photography etc. Suad Bejtovic Photography etc. For a little while now, I had the desire to own a music instrument again. I used to have a saxophone, but it was a bit loud and just complicated enough for me to lose the desire to really take lessons and learn to play it. I enjoyed making sounds on it, and sometimes those sounds would combine into phrases, even melodies. I sold the sax a few years ago in an effort to get out of some debt I had accumulated. Now, I wanted to get something new, but not very expensive, and above all, simple. 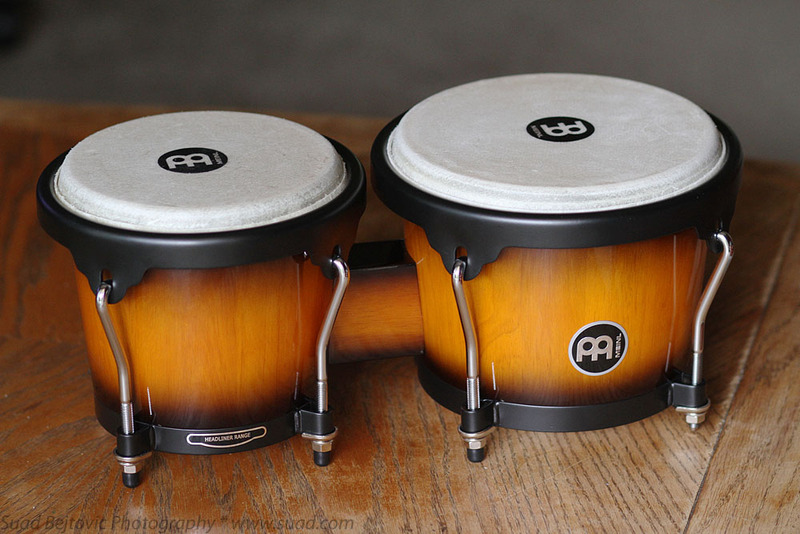 So, I started looking into bongo drums. They are a simple, but satisfying instrument, and there are many techniques and rhythms to be learned. I did some research online and visited my local “big box” instrument store, which is where I picked up this set from Meinl. Surprisingly, the price was a little lower than at the big online retailer, just under a hundred bucks. I brought them home and tuned them – the big drum (“hembra”) is around a B note, while the smaller (“macho”) is in the neighborhood of E. After that, of course, I played a couple of Carlos Santana songs and banged along with them. Leave a comment if you play an instrument. Especially if you took pictures of it.